All of us possess important data in at least one of the available digital devices like smartphone, hard disk, PC, etc. Therefore, we cannot afford to lose them as they are very precious and to our bad luck, these devices are not reliable. These devices can get corrupt or damaged without our knowledge, leading to a loss of essential data. Losing important data can be a major hassle and requires an extra amount of time and money to retrieve it back. Alas, we don't have a tool till date which is 100% dependable. Nevertheless, if you lose data due to an unexpected action, there are ways to recover it. When you delete data, or it gets deleted by mistake, you don't actually erase them. They are just marked as deleted and hidden from the operating system, displayed as removed for us. Over time, this deleted data gets rewritten when you add more data into this. Therefore, it's easy to retrieve the data using a recovery tool when no much data is added to it. To help you recover this deleted data, we have come up with some of the best hard drive recovery software, each tool having unique features and performance. You can try using multiple tools and get your work done as soon as possible. See Also: - 10 Best Tools to Check SSD Health and Monitor PerformanceIt's important to note here that these tools are used for external hard drive recovery and helps to recover deleted files on Windows. 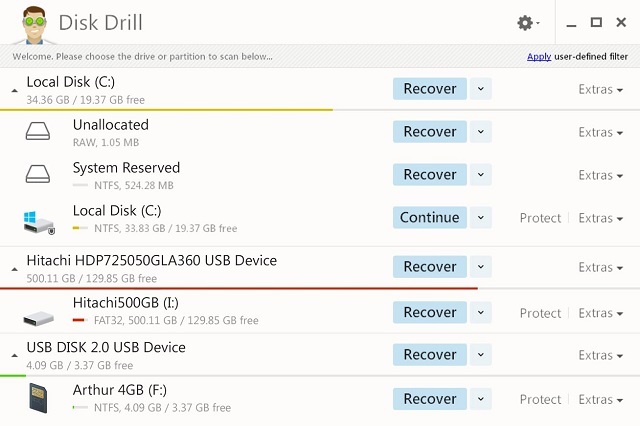 Disk Drill is a free data recovery software that is legit and helps to restore deleted files. Data loss is a significant disadvantage for any business or organization as it requires a great deal of money and time to restore it. Although hard drives are getting extremely popular these days, it still can't be relied upon for data storage. Disk Drill for Windows is extraordinary because it can restore files from the cleared recycle bin by having a look at the intrinsic file system. Using the free version of Disk Drill for Windows, you can hunt for all the lost files and retrieve up to 500-600MB of data. You can also download a well constructive and responsive application used by some of the great enterprises across the world to restore the lost files or documents without paying a single penny. This is a great opportunity indeed! When you realize that you have accidentally deleted some vital office file or your presentation PPT, drop all the works that you were doing and immediately install Disk Drill to get an instant result. You're likely to get your file if you work on it fast. To recover the lost files, all you need to do is click on the Recover button. Disk Drill doesn't expect much of user input; therefore most of the jobs will be performed by it with less user intervention. It is one of the best hard drive recovery software and is known for its self-explanatory nature. They also provide a substantial knowledge base that includes all usual data recovery related queries, mostly pertaining to how to retrieve data from hard drive and external hard drive recovery. You can find more information on their official website. 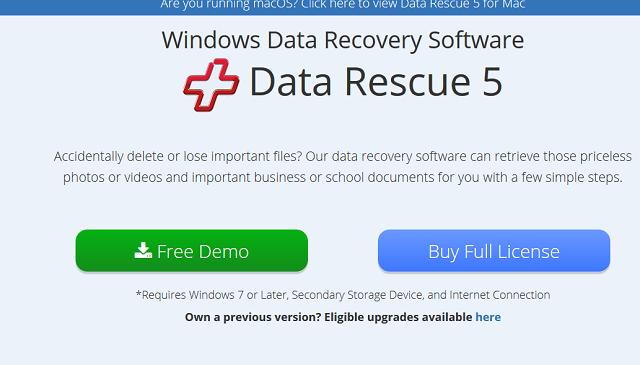 Prosoft Data Rescue 5 is the best hard drive recovery software designed exclusively for Windows that offers a broad range of data recovery tools to its users. Prosoft is created after 20 years of data recovery research that led to the development of the excellent quality tool, which was later tested in a data recovery lab. Prosoft extends a free file finder app that will let you keep track of files that you have lost and those that you can recover. There are two versions of the app - a standard version and a professional version. Both of them offer advanced recovery tools, that leads to an advanced search and you can discover the files that you want to restore. 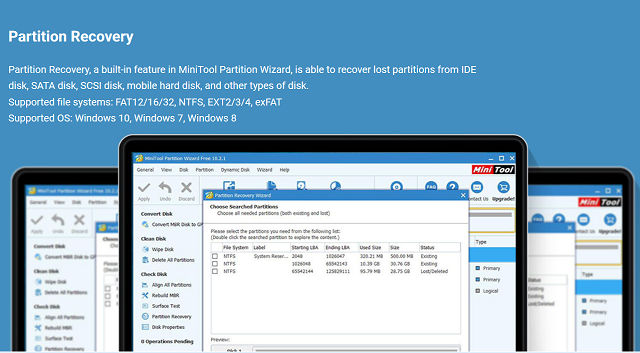 MiniTool Partition Recovery can not just recover deleted files but can also restore a full partition. It is mainly suggested for beginners because it involves basic operations and focuses primarily on partition level recovery approach. There are no advanced features and is very basic for beginners to understand. Rather than scanning the entire partition, only the ones that you want to recover could be scanned in advance. This is yet another best hard drive recovery software and is well known to people as DMDE. It a versatile app that is capable of restoring, finding and editing data on any media (it could be photos, videos, documents, etc). It is made up of specialized algorithms and is a powerful tool to retrieve deleted data. This app is not recommended for beginners and is best suitable for people who have hands-on experience with technical skills. The only problem with this software is that it doesn't get updated frequently but overall performance is excellent when it comes to data recovery. The striking feature of this app is that it can search and recover data and partition that is invisible to Windows. These are some of the best hard drive recovery software that could be used to retrieve deleted data or data that is lost accidentally due to unknown reasons. Data loss has become one of the most popular and troublesome issues and therefore choosing the right tool to deal with this issue becomes a significant task. You'll find a lot of data recovery software or tools online. Choose a high-quality one that is best suited for your problem!